Khoddami, M., Ghavam, P. (2012). Diagnostic Accuracy of Frozen Section in Ovarian Tumors: A 12-Year Review. Iranian Journal of Pathology, 7(2), 112-120. Maliheh Khoddami; Parishad Ghavam. "Diagnostic Accuracy of Frozen Section in Ovarian Tumors: A 12-Year Review". 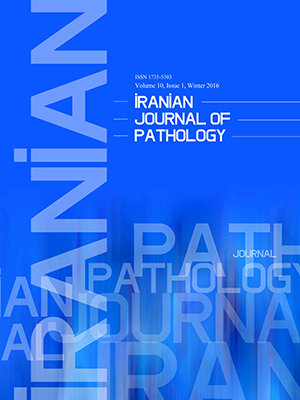 Iranian Journal of Pathology, 7, 2, 2012, 112-120. Khoddami, M., Ghavam, P. (2012). 'Diagnostic Accuracy of Frozen Section in Ovarian Tumors: A 12-Year Review', Iranian Journal of Pathology, 7(2), pp. 112-120. Khoddami, M., Ghavam, P. Diagnostic Accuracy of Frozen Section in Ovarian Tumors: A 12-Year Review. Iranian Journal of Pathology, 2012; 7(2): 112-120. Background and objective: To determine the diagnostic accuracy and pitfalls of frozen section in ovarian tumors in one of the largest university affiliated gynecologic oncology centers in Tehran, and determine the cause of discrepancies. Materials and Methods: We retrospectively analyzed the results of frozen section and permanent diagnoses of ovarian masses by reviewing the reports in the department of Pathology of Imam Hussein Hospital from 1997 to 2009. Results: Among 1498 cases of ovarian lesions, only 187 patients had both frozen and paraffin section diagnoses (age range 10-82 yr). 71.7% of these cases had complete concordance, 26.7% had partial and 1.6% had no concordance. The overall sensitivity and specificity of frozen section diagnosis were 100% and 99.3%, respectively. The sensitivity of frozen section diagnosisfor benign, borderline, and malignant lesions was 99.3%, 100% and 94.9%; and the specificities were 100%, 98.9% and 99.3% respectively. Conclusion: Our results show high sensitivity and specificity of frozen section diagnosis in ovarian masses. Pathologist’s misinterpretation was the only cause of discrepancies. Bige O, Demir A, Saygili U, Gode F, Uslu T, Koyuncuoglu M. Frozen section diagnoses of 578 ovarian tumors made by pathologists with and without expertise on gynecologic pathology. Gynecol Oncol 2011;123(1):43-6. Brun JL, Cortez A, Rouzier R, Callard P, Bazot M, Uzan S, et al. Factors influencing the use and accuracy of frozen section diagnosis of epithelial ovarian tumors. Am J Obstet Gynecol 2008;199(3):244-7. Geomini P, Bremer G, Kruitwagen R, Mol BW. Diagnostic accuracy of frozen section diagnosis of the adnexal mass: a metaanalysis. Gynecol Oncol 2005;96(1):1-9. Ilvan S, Ramazanoglu R, Ulker AE, Calay Z, Bese T, Oruc N. The accuracy of frozen section (intraoperative consultation) in the diagnosis of ovarian masses. Gynecol Oncol 2005;97(2):395-9. Maheshwari A, Gupta S, Kane S, Kulkarni Y, Goyal BK, Tongaonkar HB. Accuracy of intraoperative frozen section in the diagnosis of ovarian neoplasms: experience at a tertiary oncology center. World J Surg Oncol 2006 Feb 24;4:12:12. Pinto PB, Andrade LA, Derchain SF. Accuracy of intraoperative frozen section diagnosis of ovarian tumors. Gynecol Oncol 2001;81(2):230-2. Stewart CJ, Brennan BA, Hammond IG, Leung YC, McCartney AJ. Intraoperative assessment of ovarian tumors: a 5-year review with assessment of discrepant diagnostic cases. Int J Gynecol Pathol 2006;25(3):216-22. Twaalfhoven FC, Peters AA, Trimbos JB, Hermans J, Fleuren GJ. The accuracy of frozen section diagnosis of ovarian tumors. Gynecol Oncol 1991;41(3):189-92. Gol M, Baloglu A, Yigit S, Dogan M, Aydin C, Yensel U. Accuracy of frozen section diagnosis in ovarian tumors: Is there a change in the course of time? Int J Gynecol Cancer 2003;13(5):593-7. Houck K, Nikrui N, Duska L, Chang Y, Fuller AF, Bell D, et al. Borderline tumors of the ovary: correlation of frozen and permanent histopathologic diagnosis. Obstet Gynecol 2000;95(6 Pt 1):839-43. Obiakor I, Maiman M, Mittal K, Awobuluyi M, DiMaio T, emopoulos R. The accuracy of frozen section in the diagnosis of ovarian neoplasms. Gynecol Oncol 1991;43(1):61-3. Puls L, Heidtman E, Hunter JE, Crane M, Stafford J. The accuracy of frozen section by tumor weight for ovarian epithelial neoplasms. Gynecol Oncol 1997;67(1):16-9. Tangjitgamol S, Jesadapatrakul S, Manusirivithaya S, Sheanakul C. Accuracy of frozen section in diagnosis of ovarian mass. Int J Gynecol Cancer 2004;14(2):212-9. Wang KG, Chen TC, Wang TY, Yang YC, Su TH. Accuracy of frozen section diagnosis in gynecology. Gynecol Oncol 1998;70(1):105-10. Crum C, Lee K, Genest D, Granter S, Haefner H, Mutter J, et al. Diagnostic Gynecologic and Obstetric Pathology. New York: Saunders; 2006. Mills S, Carter D, Greenson JK, Oberman H, Reuter V, Stoler M. Sternberg's Diagnostic Surgical Pathology. 4th ed. Philadelphia: Williams & Wilkins; 2004. Benedet JL, Bender H, Jones H, III, Ngan HY, Pecorelli S. FIGO staging classifications and clinical practice guidelines in the management of gynecologic cancers. FIGO Committee on Gynecologic Oncology. Int J Gynaecol Obstet 2000;70(2):209-62. Robinson WR, Curtin JP, Morrow CP. Operative staging and conservative surgery in the management of low malignant potential ovarian tumors. Int J Gynecol Cancer 1992;2(3):113-8. Kim K, Chung HH, Kim JW, Park NH, Song YS, Kang SB. Clinical impact of under-diagnosis by frozen section examination is minimal in borderline ovarian tumors. Eur J Surg Oncol 2009;35(9):969-73. Kim JH, Kim TJ, Park YG, Lee SH, Lee CW, Song MJ, et al. Clinical analysis of intra-operative frozen section proven borderline tumors of the ovary. J Gynecol Oncol 2009;20(3):176-80. Medeiros LR, Rosa DD, Edelweiss MI, Stein AT, Bozzetti MC, Zelmanowicz A, et al. Accuracy of frozen-section analysis in the diagnosis of ovarian tumors: a systematic quantitative review. Int J Gynecol Cancer 2005;15(2):192-202. Naik R, Cross P, Lopes A, Godfrey K, Hatem MH. "True" versus "apparent" stage I epithelial ovarian cancer: value of frozen section analysis. Int J Gynecol Cancer 2006;16 Suppl 1:41-6.:41-6. Tempfer CB, Polterauer S, Bentz EK, Reinthaller A, Hefler LA. Accuracy of intraoperative frozen section analysis in borderline tumors of the ovary: a retrospective analysis of 96 cases and review of the literature. Gynecol Oncol 2007;107(2):248-52. Kurman R, Ellenson L, Ronett B. Blaustein's Pathology of the Female Genital Tract. 6th ed. New York: Springer; 2011. Robboy S, Mutter G, Prat J, bently R, Russel P, Anderson M. 2nd ed. China: Churchill Livingstone; 2009.